MANGGAS has been around for quite some time. I remember not being too impressed with their previous demo before, which title escapes me for now. 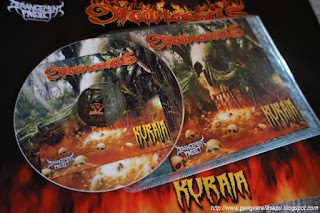 Glad to know that the band is still on it though, "Kuraia" is a Cdr release from the ever productive Derangement Project. Three tracks are listed on the cover, but there's actually four songs here. Ironworx Gravefix did a nice job for the artwork as usual, time to devour the content then. 2011 MANGGAS is still deeply rooted to their eastern Metal heritage, that is certain. Characters of Malaysian Metal especially during the 90's projecting strongly on "Kuraia", but this time there's more of this influences from the symphonic/epic power Metal scene whenever they wish to go melodic. And I will not be surprised if they go more into that direction if this release is an indication of things to come. MANGGAS excels on those melodic parts here, particularly when the solos made their presence. 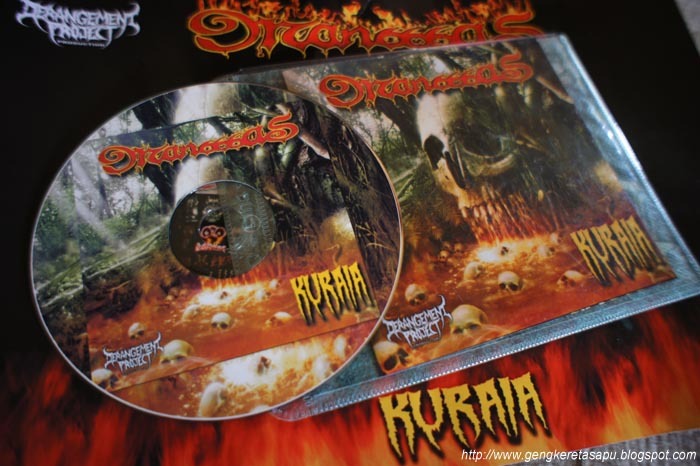 "Kuraia Supuratism", for example; is all about mid-paced eastern Metal that you ever need to know. "Deathrobe" feels like being composed directly after listening to LANGSUIR's "Occultus Mysticism" demo and injecting it with some power Metal serum. "Total Tabak Bauta" tried being aggressive initially, but when those melodic parts chip in, they swallow everything else. They are the main ingredients in MANGGAS music as of today. The untitled, hidden fourth track is basically the same mix like the ones described here. "Kuraia" is, most assuredly, definitely better than the previous demo that I forgot. And will be just fine for any eastern Metal listeners out there. There's no surprises here (apart from being better than before), MANGGAS is doing it safely within the confines.